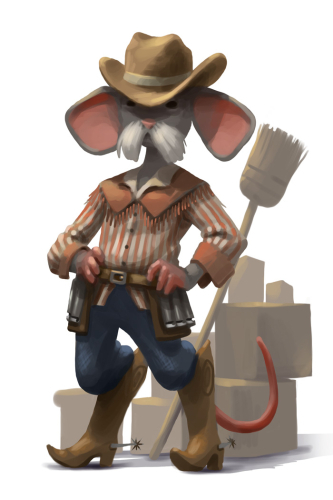 The Shopkeeper Mouse is a breed of mouse found in the Claw Shot City and is also a part of the Corrupt Cartel gang when working on a Wanted Poster. It is not known to drop any loot. Said to be here to make an honest living, one must wonder about the shopkeeper mice. Their prices are atrocious and it doesn't look like they have updated their inventory in ages. Considering they have so many brooms for sale, you think they might sweep up around their shops every once and a while. We don't know, maybe they're up to something… That or maybe everybody just has enough tin cups and brooms to hold them over. Law traps are very effective against the Shopkeeper Mouse. 25 June 2013: The Shopkeeper Mouse was released with the introduction of the Claw Shot City location. This page was last edited on 9 April 2017, at 01:50.